The mass-adoption of mobile as the primary means of business communications has created challenges for both users and businesses. Many independent workers or “prosumers” have to juggle business and personal personas simultaneously, while the always-on nature of mobile devices upsets their work/life balance. When it comes to Over-The-Top (OTT) VoIP users have become painfully familiar with the best-effort quality and cumbersome user experience of these services as opposed to the relative simplicity of native dialer applications and high quality of cellular voice. For small businesses and teams, a mobile workforce challenges them to maximize productivity and customer service with simple and reliable mobile group communications and collaboration, without spending time, money and resources to navigate complex Unified Communications (UC) services. Mobile service providers are in fierce price wars with each other to acquire and retain their high- value customers, but have done little to build long-term loyalty or sustainable competitive advantage. The opportunity is now for these providers to deliver a new breed of services, targeted at the growing and underserved market segments of the global workforce. 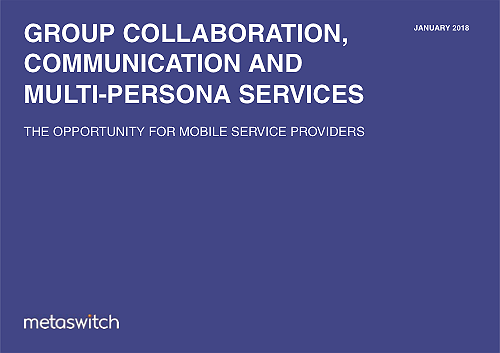 Building these services on core capabilities stemming from network ownership and control cannot be easily replicated by internet rivals, and will position the mobile service provider to capture new revenues above and beyond their traditional business communications offerings.